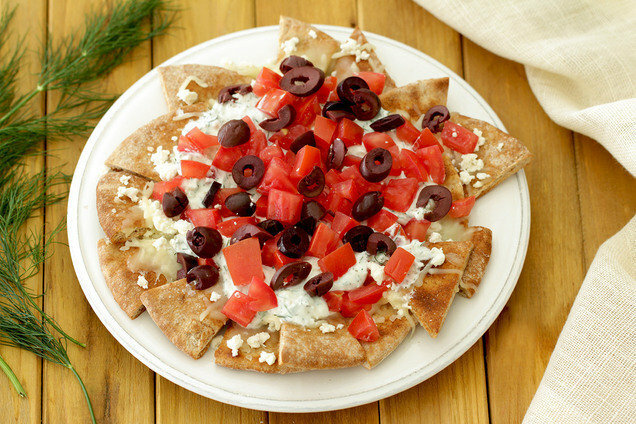 Store-bought pita chips are often packed with fat... Not our DIY baked crisps! We loaded them up with Greek-style goods, and the result is mind-meltingly delicious. Check it out! Preheat oven to 425 degrees. Spray a large baking sheet with nonstick spray. Cut pitas into halves (pockets), and cut each half into 5 triangles, for a total of 20 triangles. Place on the baking sheet in an even layer. Bake until crispy, 4 - 6 minutes. Meanwhile, in a small bowl, combine yogurt, 1 tbsp. feta, dill, garlic, salt, and pepper. Mix well. Remove sheet from oven, but leave oven on. Rearrange triangles on the center of the sheet so that they touch and slightly overlap. Top with mozzarella and remaining 3 tbsp. feta. Bake until mozzarella has melted, 1 - 2 minutes. Dollop yogurt mixture over nachos. Top with tomatoes and olives. Hungry for More Calorie-Slashed Nachos? Today, July 11th, is both National Blueberry Muffin Day and Cheer Up the Lonely Day. Handing out our Blueberry Streusel Muffins sounds like a pretty good way to cheer people up! You'll want to share your nachos with a buddy. Click "Send to a Friend" to set up a snack date!